Tollenaere Commemorative Badge - Bronze and Silver. 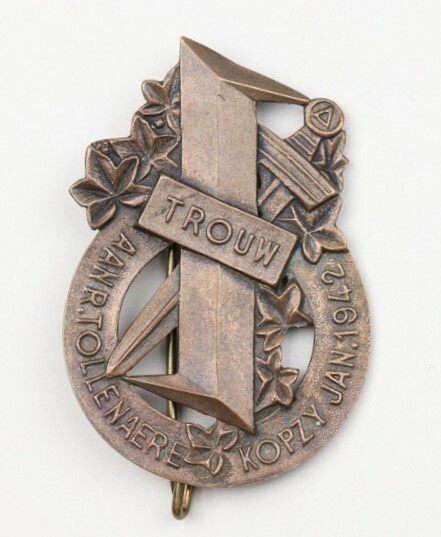 Tollenaere Commemorative Badge bronze - reverse. Tollenaere Commemorative Badge Silver - Reverse. 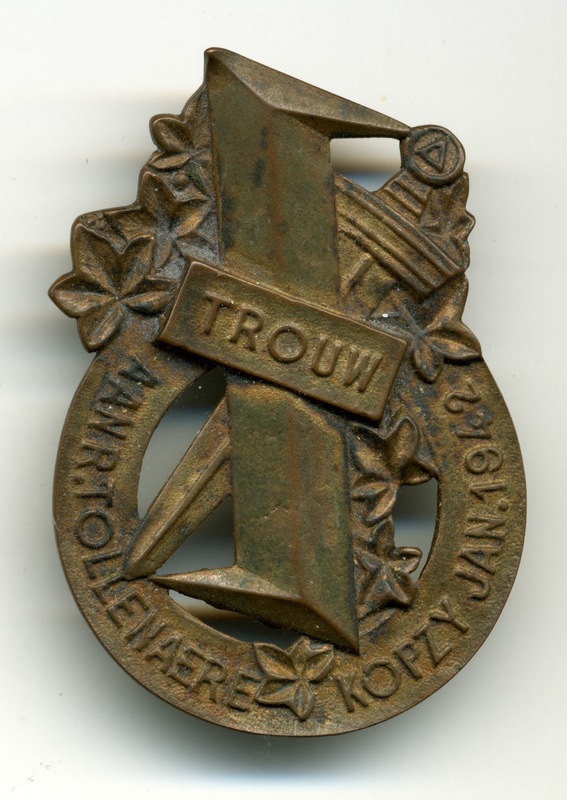 This badge is in bronze and silver and measures 53mm high and 36mm wide and comprises of a circle onto which in raised capital letters is the inscription, AAN R. TOLLENAERE broken by a five pointed leave KOPZY JAN. 1942. A broad double-edged sword bisects the upper part of the circle and the pommel is in the form of the badge of the VNV. 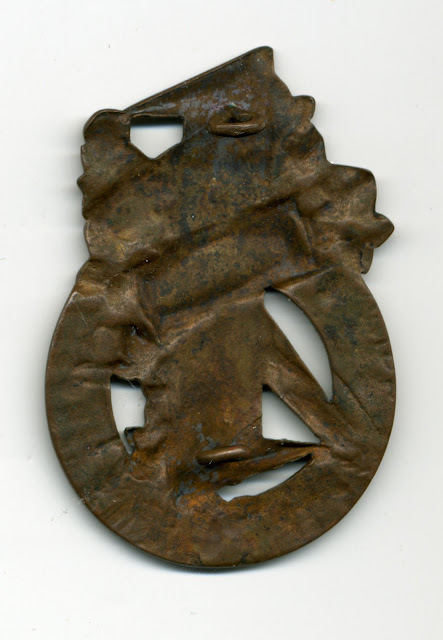 The Wolf Hook, the emblem of the “Black Brigade” lies across the circle and sword. It has three leaves at the top left and two in the circles void. 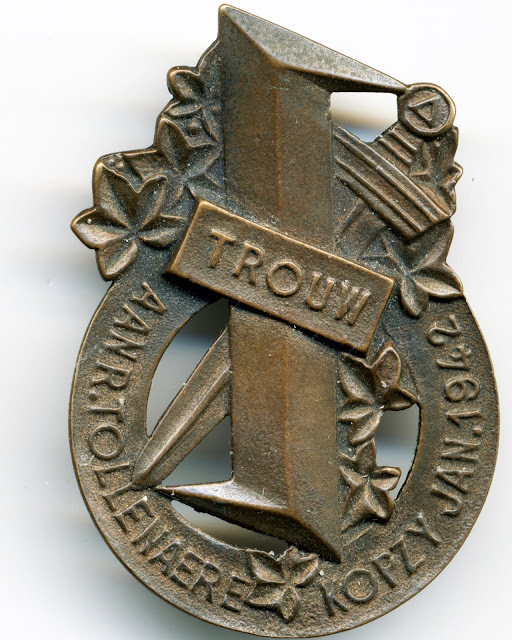 On the transverse of the Wolf Hook on an oblong box are the raised letters TROUW, which translates to Loyalty. 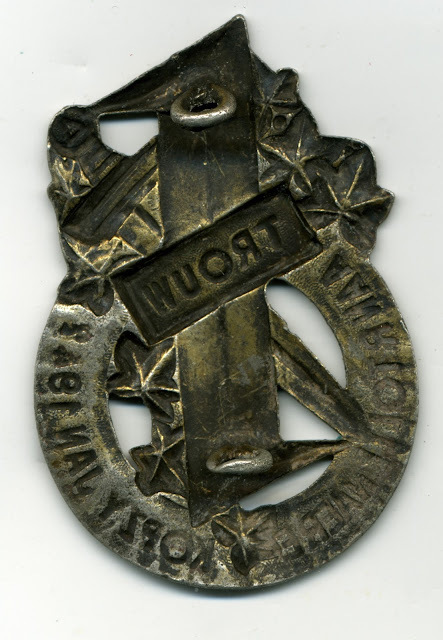 The reverse shows the impression of the obverse and has two eyelets one at the top and the other at the bottom of the badge through which is placed a split bar to hold it to the uniform. The badge was worn on the left breast pocket and was authorised to be worn on German uniforms. The badge is correctly known as the “Tollenaere Kenteeken” but more commonly referred to as either the “Trouw” or the “Kopzy” badge. 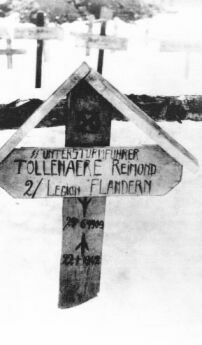 Reimond Tollenaere fell at Kopzy, near Leningrad on 22 January 1942. 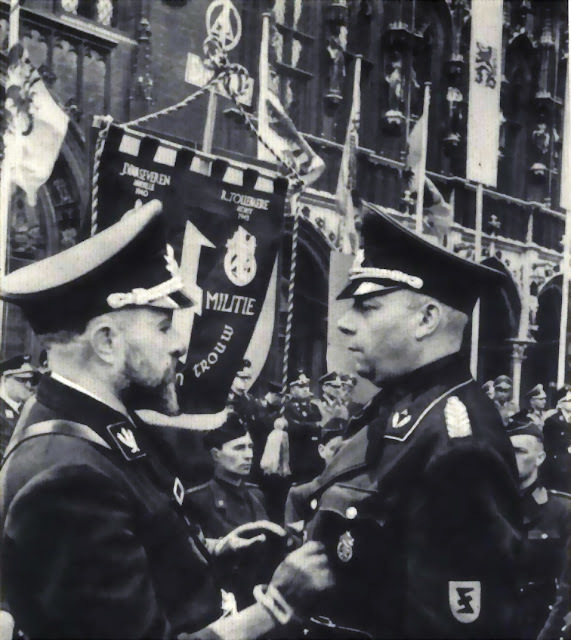 He was the popular commander of the VNV’s uniformed militia, the “Black Brigade” and been one of the first to volunteer for service with the Flemish Legion. The leadership of the VNV instituted the award to commemorate his “hero’s death” and to reward loyalty and sacrifice of its members. A member of the Flemish Legion wearing the Tollenaere Badge. 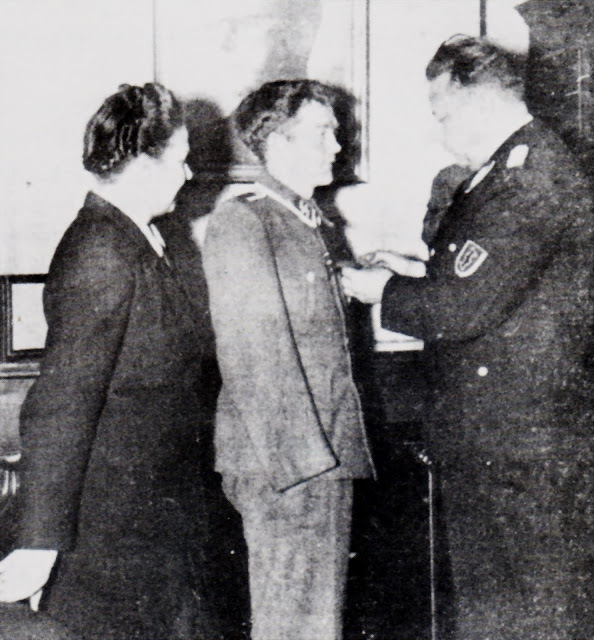 SS-Sturmbannführer von Lettow – Vorbeck presenting the award. Vorbeck was just long enough on the eastern front as commander of the Flemish Legion to decorate his men with the Tollenaere Commemorative Badge, June 1942. Tollenaere Commemorative Badge in wear. 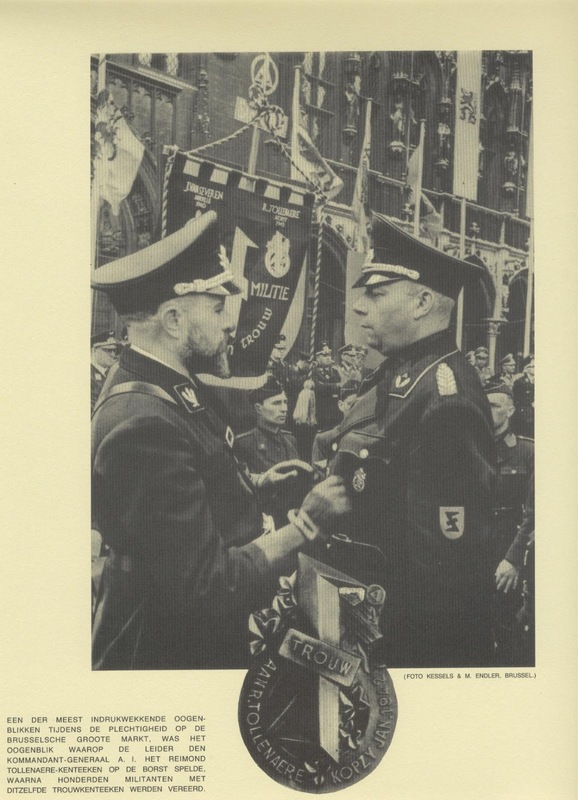 Das Reich Member with Tollenaere Commemorative Badge - Silver. 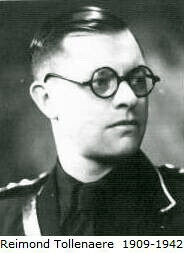 Tollenaere , Dr. Reimond - SS-Untersturmführer. 29 June1909 - 22 January1942 KIA. Born: 29. June 1909 in Oostakker / Flanders. Killed in Action: 22. January 1942 at Koptsy near Leningrad (accidentally killed by an artillery barrage from the 250. (Spanish)Infanterie-Division of the German Army during an inspection of the Flemish Legion's forward lines; buried at Podbyeryezhve, Russia). 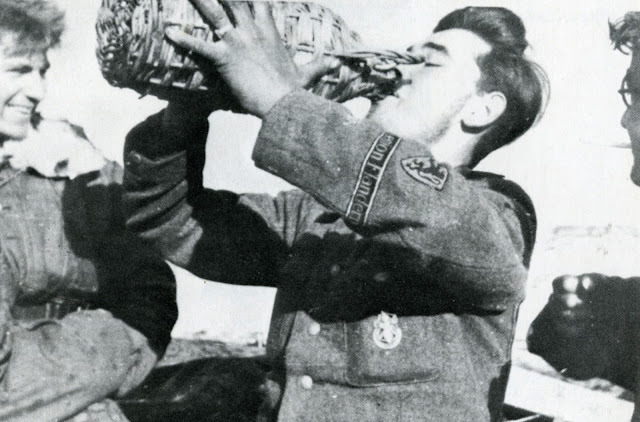 Assigned to 2.Kompanie / Legion Flandern: end of September 1941 - 22. January 1942. Officer training at Lauenberg / Pommern: August 1941 - end of September 1941. 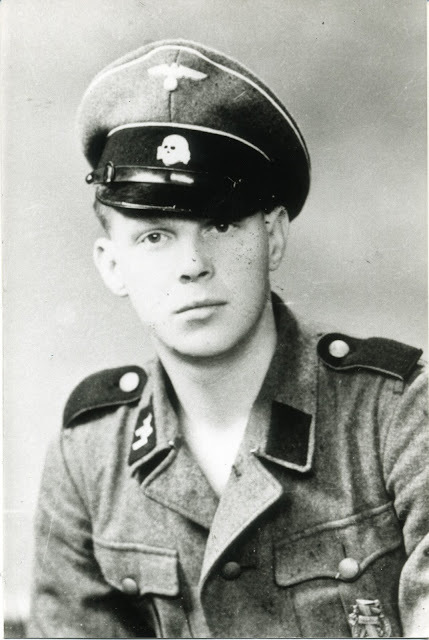 Volunteered for Waffen-SS service: 17. July 1941. Arrested by the Belgian authorities: 10. May 1940; liberated by German troops: 21. June 1940. Algemeen Propagandaleider (general propaganda leader) of the V.N.V. : 1933. In Germany: 1931 - 1932. Studied law at the R.U.G. (University of Ghent): 1928 - 1934. 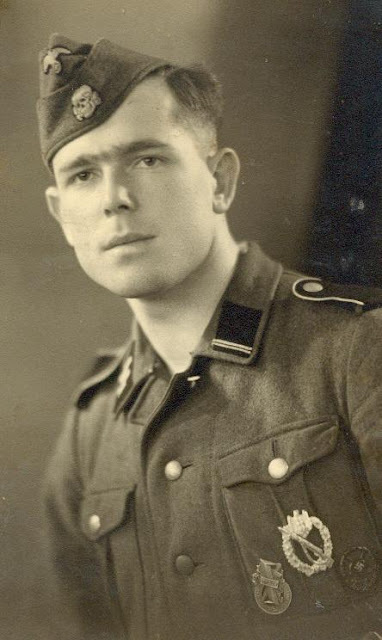 * Following his death, Reimond Tollenaere's younger brother, Leo, volunteered to served in the Flemish Legion of the Waffen-SS. * Married with three children. * Staunch anti-communuist - devoted National-Socialist, expressed strong hatred for the Belgian state. * The Z.B. [Zwarte Brigade - Black Brigade] was founded in 1933 by the V.N.V. to secure party rallies. Staf de Clerq decorates Joris van Steenland. 2nd February 1899 - 2nd February 1972. He was born in the village Sint-Joris-aan-de-IJzer. 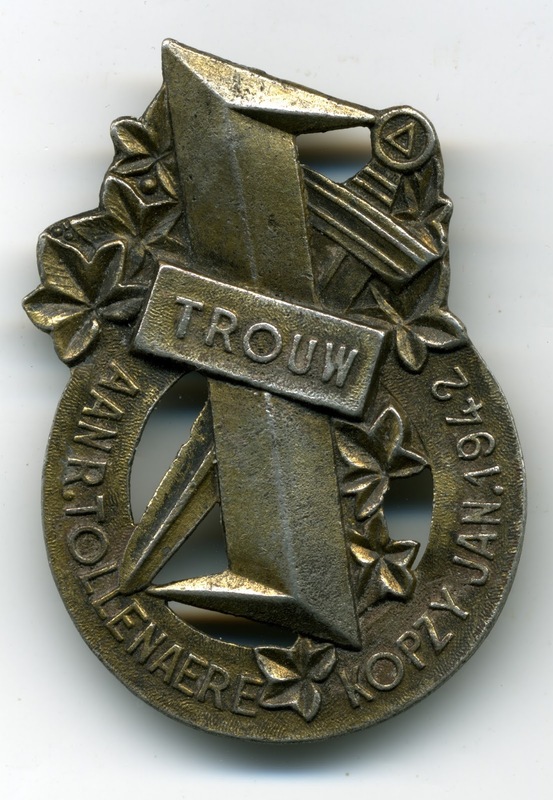 During the First World War he was a soldier and after wards became member of the 'Verbond der Vlaams oud-strijders VOS' Flemish old-soldiers organisation. In 1920 he was a teacher at the village of Gistel. In 1925 he became politically active within the 'Frontpartij' and in 1925 in the ‘Katholiek Vlaamsch Nationaal Verbond ' Catholic Flemish National Alliance. In 1928 he started a shoe factory but with the crisis of 1935 it went bankrupt. In 1932 he became a member of the village council of Gistel and a member of the West-Flemish Province Council. In 1933 he became a member of the VNV 'Vlaams Nationaal Verbond' Flemisch National Alliance. 1935 saw him become the representative of the party in the region Veurne-Oostende-Diksmuide. In 1936 he was elected for the Vlaamsch Nationaal Blok (VNB) Flemisch National Blok at the Province Council. In 1939 went another member for that region Jeroom Leuridan was elevated to the Senate, Joris took his seat in the Chamber. 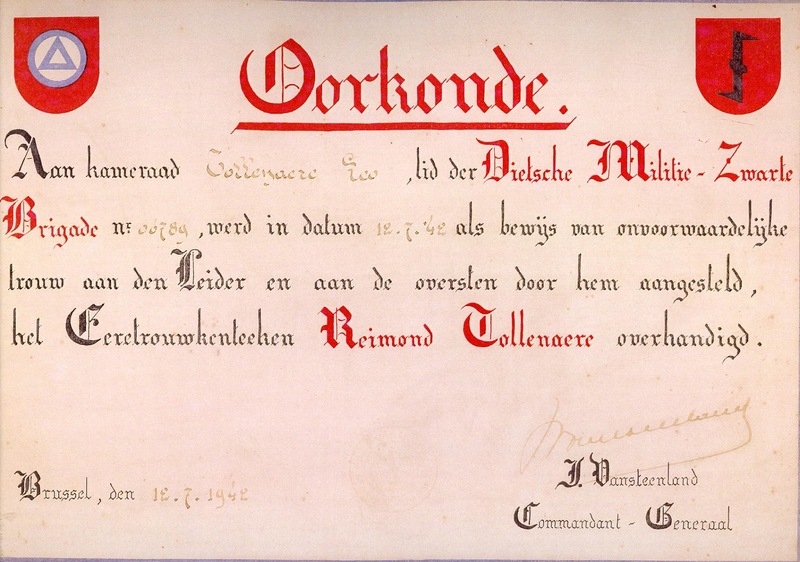 After raising the Militia DM/ZB in May 1941 Joris van Steenland became Adjunct-Commandant-Generaal (nr 2) In August 1941 went Reimond Tollenaere joined the Flemish Legion on the Eastern Front Joris van Steenland became acting leader of the Militia. 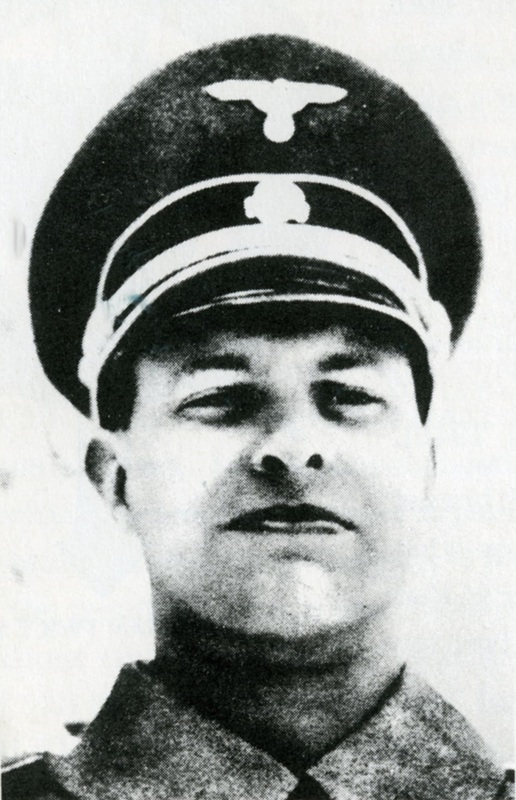 In 1942 after Reimond Tollenaere death on the Russian Front he became the leader of the Militia, he was very active in recruit the Flemish into the Waffen SS, and the other paramilitary formations. 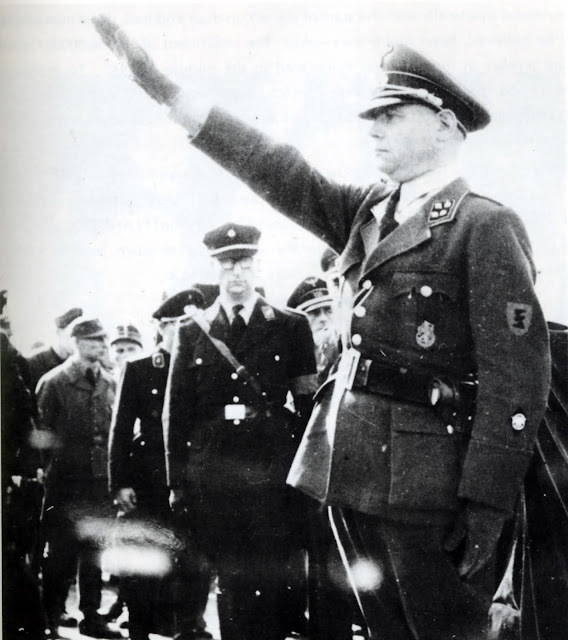 In January 1943 he visited Flemish members of the NSKK in Russia. He also played a role in the anti-partisan actions against the resistance in 1944. 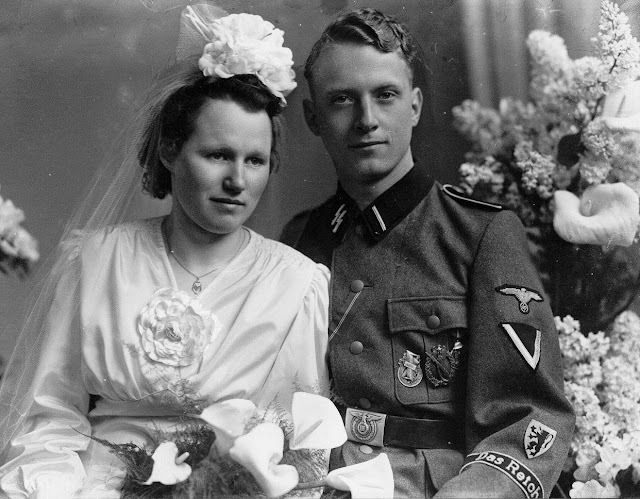 In September 1944 he fled to Germany where he played an important role in the VNV movement which had fled to Germany. For his part in collaboration with the Germans, he was tried in 1946 and was given the death penalty. In 1947 this was confirmed by the court-martial. In 1949 his sentence was commuted to life imprisonment but in 1951 he was released from of prison. After this he played no part in political life. He died on 2nd Febuary1972, at Aalst. The Leader of the Flemish D.M. 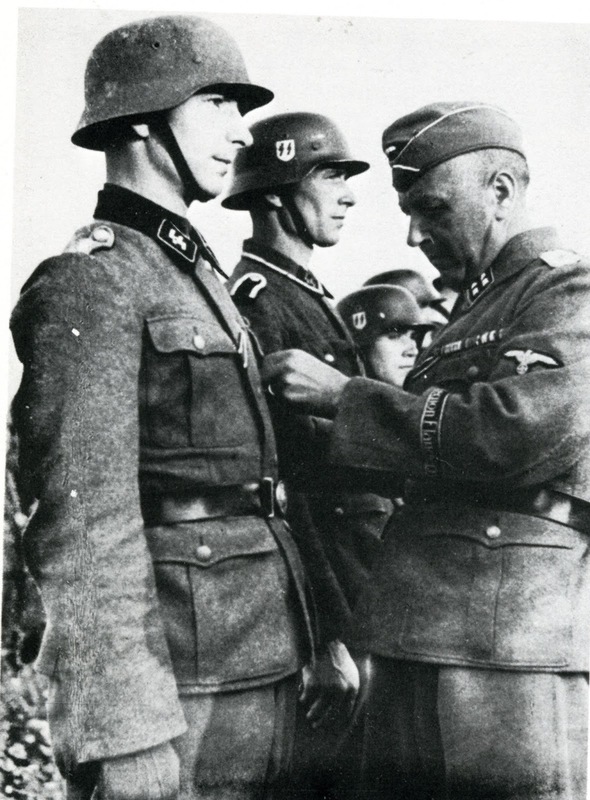 Joris van Steenlanlandt awards the Tollenaere Badge to a wounded Flemish Legion SS-Unterscharführer. Staf Rits at the funeral of Staf de Clerq. 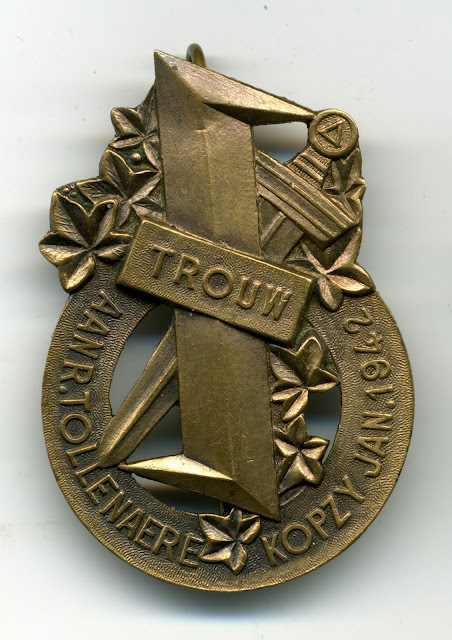 Tollenaere Commemorative Badge - Bronze with Copy Variation . This is an interesting Badge. It is considered to be a Fake and is widely available in Belgium. However from study of the badge it seems that there are three distinct dies that have been employed in the manufacture. This is illustrated by the three reverse pictures shown. 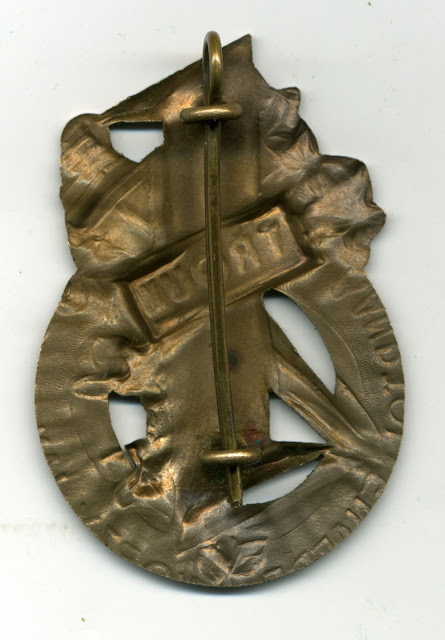 The hook on Badge - 3 - Reverse is different to that employed on the other two examples Also the badge is considerably smaller than the known originals. This leads to two questions, why would the faker make the award a different size and secondly why three different dies. So the conclusion could be drawn, as these pieces have been available since the mid 60's, that they could be legitimate pieces that were constructed for the greater bestowal that would have been inevitable if the War had continued and if the outcome had be different. Tollenaere Commemorative Badge - Bronze - Copy Variation Badge - 1 - Obverse. Tollenaere Commemorative Badge - Bronze - Copy Variation Badge - 3 - Obverse. 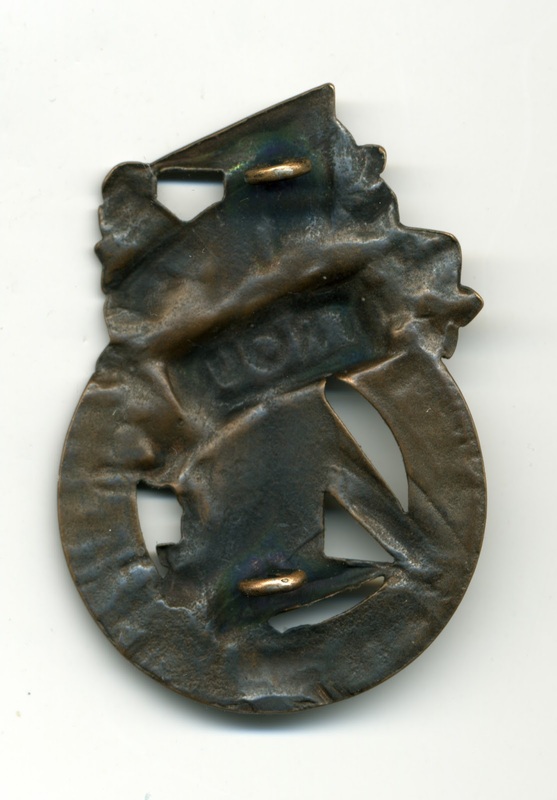 Tollenaere Commemorative Badge - Bronze - Copy Variation Badge - 1 - Reverse. 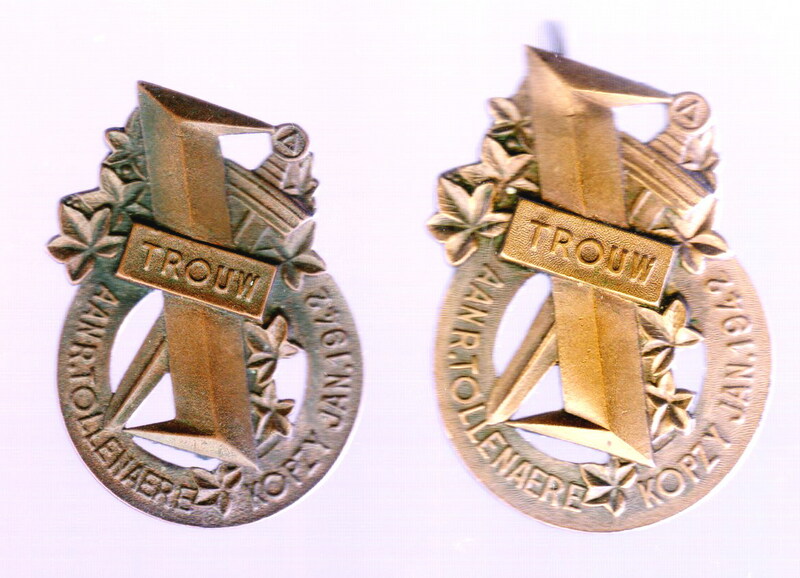 Tollenaere Commemorative Badge - Bronze - Copy Variation Badge - 2 - Reverse. 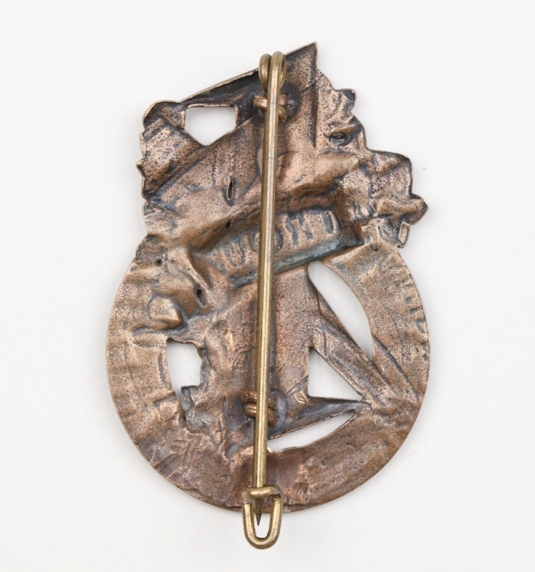 Tollenaere Commemorative Badge - Bronze - Copy Variation Badge - 3 - Reverse. Very nice website, and award! Beautiful pictures, history and rare award!